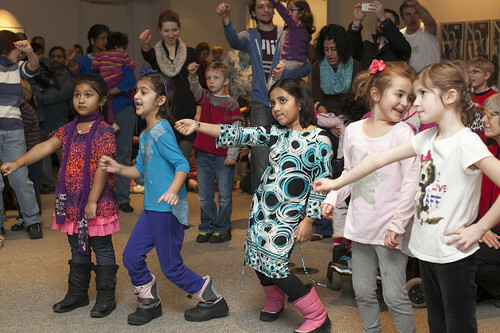 We shimmied and shaked at Family Day: Art That Moves. We showed our moves at a dance party with everyone’s favorite kids band, Koo Koo Kanga Roo, celebrated the art of motion with cartoon-inspired performances from the In the Heart of the Beast Puppet and Mask Theatre, splattered and smeared paints in the style of Jackson Pollack and other Action Painters, acted out the life cycle of a butterfly and enjoyed “The Very Hungry Caterpillar” as told by CTC, and more! Check out upcoming Family Days.